Party DJs Serving All of Central Florida. Quinceanera DJs Serving All of Central Florida. As your Master of Ceremonies, we will: Announce all activities and events to take place throughout the reception and assure everything runs according to plan. Work hand in hand with all other vendors. Welcome all guest and keep them informed. Professional DJs / MCs serving Central Florida Since 2001. Aaron Entertainment has been providing professional wedding DJs / Emcees and party DJs / Emcees since 2001. We have Local DJs available for your event throughout all of Central Florida. 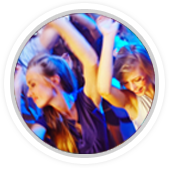 We provide the best in Wedding DJs / Emcees, Adult Party DJs / Emcees, Teen party DJs, Tween Party DJs, Sweet 16 Party DJs, Quinceanera DJs, Holiday party DJs, and School dance DJs, In these difficult economic times, we are here to make sure you don't have to choose between quality and affordability - because we give you both! 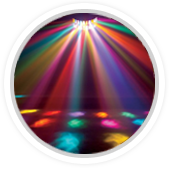 Unlike most DJ companies who do not post any of their prices on their website, here at Aaron Entertainment Mobile DJs a complete price list is posted on the wedding page, the party page, and the Quinceanera page so you can see exactly what our prices are for the type of event you are planning. Access to these pages is available through the services tab at the top of this page. Please enter the letters and numbers above to prove you are human. Dan (DJ FoFo) was fantastic! He made sure to consult with me on every little detail.The music was well chosen and kept everyone dancing! I wouldn't hesitate to use Aaron Entertainment Mobile DJs again in the future!! © 2019 Aaron Entertainment. All rights reserved. Website designed by Fresh Element.